When Mel Morris bought into Derby County Football Club in May 2014 he not only bought into the club but into the loyal fan base too. Being a lifelong Rams supporter himself he was conscious of the important contribution that fans provide to a football club. Pride Park is home to 30,000 fans on match days and the importance of providing a warm and comfortable environment for spectators was paramount to Mr Morris, especially with more and more families attending games and the winter months being so cold. The heated concourse is thought to be the first one in the UK and has received a very warm welcome from fans with the club receiving very positive feedback verbally and through social media. It has been a valuable initiative adding to the enjoyment of a match day experience. Derby County spokesman Paul Tyrrell, said: “We are continuously looking for ways to improve the level of service and quality of the match day experience for our supporters. Many enhancements have been made to Pride Park recently and our decision to introduce a new heating system in our concourses was a vital element of this upgrade programme. “The heating system is one of the first to be introduced to stadia in the UK and are we delighted with it. Importantly, our supporters will feel the benefit of it for many seasons to come,” Mr Tyrell added. 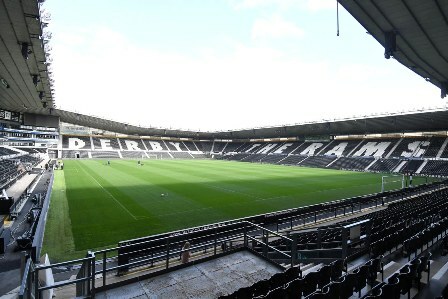 Reznor was able to work with Pegasus to provide the ideal heating solution for Derby County FC. The concourse is open to the pitch, therefore the outside air would constantly infiltrate into the area. The Reznor Nor-Ray-Vac radiant heating system was ideal in this instance, as the system transfers energy by means of electromagnetic waves which pass through the air without heating it, instead heating the surfaces beneath the heater. This method results in an increase in energy efficiency, as energy is not wasted heating the cooled air. Another major benefit to radiant heat is to be able to create an environment without stuffiness. As the concourse is situated underneath the stadium seats, the versatility of the system design meant the flue was able to installed horizontally through the exterior walls. Radiant tube heaters, mounted overhead, produce infrared radiant heat that is directed downward by a reflector. The infrared heat passes through the air without heating it and falls on people, floors and equipment below by creating a comfortable all round radiant warmth at low level, without wastefully heating the whole volume of the building or the roof space. Radiant heat warms objects and surfaces, increasing the mean radiant temperature and reducing the body’s loss of heat to its surroundings. In addition, by eliminating air movement, convective loss of heat from the body will also be reduced. A rapid response time is ideal to combat changed ambient conditions. Don’t leave your supporters out in the cold next season, visit www.reznor.eu to find out more.